DEX solutions for IT and complex technologies are designed to effectively respond to one of the most dynamic, innovative and ever-changing industries. Considering consumer expectations for more advanced products, shrinking cylce times, shortened lead times, and the need for more cost effective options when parts become unavailable, DEX solutions work to improve agility, boost responsiveness and increase profitability. 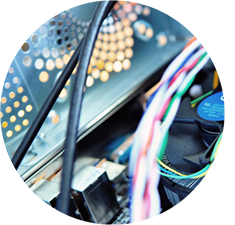 With decades of hands on experience in outsourced electronics repair, DEX is able to build on core competencies to enhance workflow processes and failure data analysis, to produce higher repair yields and reduce the number of NFF (No Fault Found) returns. DEX is ISO certified 9001:2000, 13485:2003, 14001, and warranties quality on all repair and parts services.